Home Companies Jiangyin Dingbo Technology CO., Ltd. 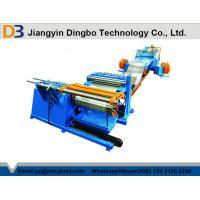 Simple slitting line is a length ways cutting production line, for cutting metal sheet strip. Slitting line can uncoil metal sheet strip coil, then slit(cut) the metal sheet strip longitudinal, then rewind the stilted metal sheet strips, for getting narrow metal sheet strip coils.Slitting line are for metal sheet strip coil cutting service center, press machine stamping & punching, metal sheet strip processing,etc. Jiangyin Dingbo Technology Co., Ltd. is professional manufacturer and exporter specializing in designing, manufacturing, technology developing, sales and services in building materials machinery whcih mainly include all kinds of roll forming machine, tube making machine, slitting line and cut to length line,and discontinuous PU sandwich panel production line and embossing machine. The main products of our factory is color steel roofing and wall roll forming machine, pre-painted steel forming machine, floor deck forming machine, automatical C/Z Purlin forming machine, Guardrail forming machine, Racking roll forming machine, cable tray roll forming machine, Glazed Tile forming machine, DownPipe forming machine, Roller shutter door machine,tube mill, steell and aluminum embossing machine,steel slitting and cut to length line, PU sandwich panel line and so on. The products are widely used in such as building structure, steel structure warehouse, factory buildings, supermarket, Nursing homes, villas and other construction projects, Our factory can meet the construction enterprises, automobile industry, Iron and steel production enterprises' growing demands. Dingbo Technology is located in Wuxi city, Jiangsu province which is very close to Shanghai, It's about half an hour's journey. We enojoy the convenient transportation and advantageous location which supply good business opportunities for the buyers home and abroad.